Alright, you’ve got a spiffy deck, maybe one you constructed yourself using our handy guide, or maybe you’re using one of our Terminal Directive starter decks. Most likely it’s a deck you found online, which is great! But even if you have the best deck, they don’t play themselves. 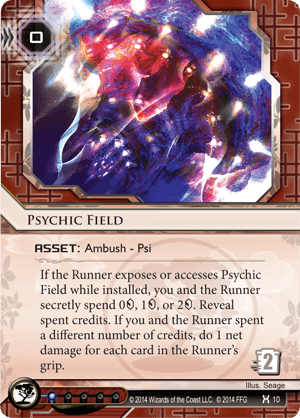 And while each deck has its own feel and flavor, you still need to understand the fundamentals of Netrunner. For some reason I had a lot more to say about running than being the corp. Maybe because the runner has to often be more reactive, while corp strategy is usually more closely aligned with the deck strategy. 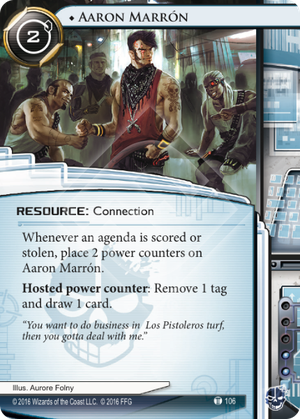 Regardless, here are 10 tips to improve your Netrunner game. Frankly, a lot of this is understanding deck archetypes, which will come with time, but even if you don’t know that many of the popular decks out there, you can, and should, gather any information you can immediately. 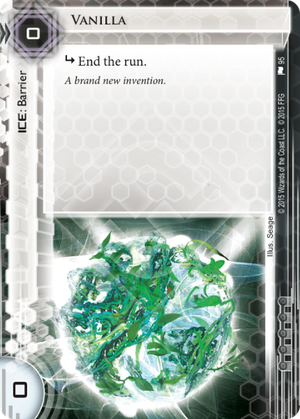 HB: Engineering the Future—Will be running bioroid ice and probably at least 5 3/2 agendas. This means they might try to sneak an unadvanced agenda out in the early game behind a single piece of ice, and if I run that server first click, I have a good chance of being able to click through it. SYNC, Near-Earth Hub, or Controlling The Message—Unless I can get tag protection out early, like Aaron Maron, I need to be very careful about ending a turn with fewer than 8 (or 12 w/SYNC) credits if I ran that turn, or I am vulnerable to Hard-Hitting News. Again, unless I have Aaron out, I also need to be checking unadvanced cards liberally, because an unadvanced Breaking News can be turned into a Closed Accounts, All-Seeing Eye, or Exchange of Information. So burst economy early is key. Jinteki PE or PU—Will likely have very little ice and a lot of net damage. This means that cards are my currency, not so much credits. I will also want to be running unadvanced servers liberally on clicks 1 and 2 to find agendas they’re trying to sneak out or bait. Jinteki RP or Palana—Will most likely be a more glacier style, so I will need to get my rig up with a lot of economy to lock down the late game. It will also probably have dangerous ice like Komainu, DNA Tracker, and Cortex Lock, so I will need to place a priority on sentry and code gate breakers above barrier breakers. Pretty much any Weyland–Will most likely have a kill package involving Midseason Replacements, so I need to be very aware of net credit differential to open up times when I am able to steal agendas. Knowing this kind of basic information will help you immensely as you play out the game. It should also be something you’re thinking about when deckbuilding, so you can play appropriately. For example, I nearly always run Film Critic in my Shaper decks, because my local meta enjoys playing Weyland and Jinteki damage decks, and Film Critic neutralizes Midseasons, Jinteki PE, and agendas like Fetal AI and The Future Perfect. But, if I’m not hitting an ID that is likely to have those cards, I can safely mulligan out of or trash my Film Critic. On an even broader level, you can usually tell if the deck is going to try to rush you or build up a board state by the first couple of turns. This can alter your behavior by signaling to you that you should perhaps dig for certain tech cards, or try to be aggressive for early runs. The key here is that as a runner you decks don’t play themselves, even more so than with corp. Even if you have a focused gameplan you need to be observant and reactive to what the corp is doing and what you think their likely strategy will be. This piece of advice applies to both sides and is one of the biggest mistakes I made when I first started playing Netrunner. I would look at my cards, see a good one to play, and immediately lead with that instead of thinking through my turn. For example, maybe I’m playing a standard shaper deck with Magnum Opus as my primary economic source. One of my top priorities for this deck is to install MOpus early, and I’ve been fortunate enough to have it in my opening hand. My first instinct is to throw that down immediately and start clicking for efficient credits. But what I should be doing is pausing, checking out my options, and figuring out what the best overall plan is. Perhaps the corp left RnD open, and I have a Sure Gamble in hand. Getting an early access on RnD right now is much more efficient than in a turn or two when it has a piece of ice in front of it. Furthermore, because of the Sure Gamble, even if I trash a card from RnD, I can probably still maintain at least 5 credits with which I can play MOpus. So maybe I play Sure Gamble, then run RnD, then play MOpus. But what do I do with my 4th click? I suppose I could click for 2 credits. That’s not bad. But clicking for 2 credits on 4th click is essentially just the same thing as clicking for 2 at the start of the next turn. Is there a better play? Perhaps instead I’ll draw a card. There’s a plan. I get a run, I can perhaps trash something, and I get MOpus on the table and draw a card to boot. This is certainly better than the initial impulse to begin with the MOpus install, but there is an absolutely critical mistake here. In almost every circumstance, if you are going to draw a card, you should do that at the beginning of the turn, for the very simple reason that you might draw something that improves your plan. So really this is two tips for the price of one: plan your entire turn, and draw first. Running on a server always carries some element of risk, but you want to avoid that as much as possible. The best way you can do that is by avoiding last click runs. This particularly applies to games against Jinteki, and to a lesser extent NBN, for the simple reason that you don’t want to be tagged or run into a trap with no way of recuperating. As a runner, ice is scary. It comes into the game facedown and can potentially flatline you. You are right to fear ice, but I think many runners are too scared. Again, part of this is knowing the cardpool and what kind of ice your opponent is likely to have in their deck. But you can also think more broadly and get a good idea of what you might run into. A good piece of advice that I was taught when I first started playing is to always get your sentry breaker out before blindly running into ice. This is because each type of ice has its own flavor and sentries tend to be of the kill and destroy variety. Code gate ice tends to have cool effects, but if you run through a piece in the early game it’s usually not too bad. The exception to this is some of the ice from the last cycle like DNA Tracker or Fairchild 3.0. But note how expensive those pieces of ice are–if the corp isn’t flush with cash they might not be able to rez a nasty code gate. Barrier ice rarely does anything more than end the run, so it’s safe to run without your barrier breaker. The worst thing that can happen is a failed run. Understanding the ice pool broadly can also help. NBN ice, for example, frequently has traces on their mean subroutines, so you can avoid them with enough money. And the most popular NBN sentry is Data Raven, which allows you to simply end the run if you can’t/do not want to break it. HB has a lot of bioroid ice, so if you run on the first click, you can avoid nasty subroutines from the Ichis, Zed, or Fairchildren simply by clicking through. If you read Friday’s post about deckbuilding, you’re familiar with the concept of tempo. Briefly, tempo is the idea of a relative advantage in board state and/or resources. Runners are acutely aware of the fact that it costs money and time to break ice, but frequently underestimate how much of a tempo it can be for the corp to rez ice. In the long run, of course, running a server multiple times is going to cost more to you than it did for the corp, but particularly in the early game you can gain a tempo advantage with aggressive running. Let’s look at a very simple example. Suppose the corp doing a standard opening and ices HQ, RnD, and takes a credit. You’re reasonably certain that they don’t have very much, if any, ice that will hurt badly to run into at this point. You could spend 4 clicks building up your board state, or you could instead use one of those clicks to run. You encounter an Eli and bounce off of it. If the base economic value of a click is 1 credit, then you just tripled that in relative terms because the corp is down 3 credits. Furthermore, now they’re priced out of cards like Hedge Fund or Adonis Campaign without needing to click for credits. Another example. You’re playing an ETF glacier-style deck and the corp placed a card in their scoring server and advanced it once. You are certain this is an agenda. Looking at your breakers and cash, you think it’s a toss up whether or not you’re going to be able to access this agenda. And since the corp did signal that it’s an agenda, they probably did the math already and determined that you can’t. However, the corp only has 10 credits. In this situation, instead of risking the agenda steal that probably won’t work, you can instead run on a central server for a more efficient run (maybe you have an RnD interface installed), and force the corp into a tough decision. Since they don’t have a lot of money, any ice they rez in front of RnD might take away their ability to rez ice in the scoring server. So maybe they let you into RnD, which could open up multiple runs there that turn, or maybe they do rez ice and you can use that to attempt a run on the scoring server later that turn. To become good at Netrunner you have to understand agenda density. In a game with so much risk calculation, this is the most important one to track. At the beginning of the game, the agenda density of RnD and HQ are equal. (I suppose you could argue that if the corp did not mulligan, there are marginally better odds in RnD because if they were agenda flooded they would have mulliganed.) But as the game progresses that changes. Suppose there’s a situation where you’re on turn 4 and you haven’t seen any agendas at all. Everything installed in a server and in archives are face up, and you haven’t had any accesses. At this point in the game, the average agenda density favors HQ, because it now contains all of the agendas that started in HQ, plus all of the agendas in those first few RnD cards that the corp drew. The longer the game progresses without agendas appearing somewhere, the more dense HQ becomes. This is why Jackson Howard is such an important card for corps. Even though it helps them cycle agendas back into RnD, you can still gain information from Jackson regarding density. 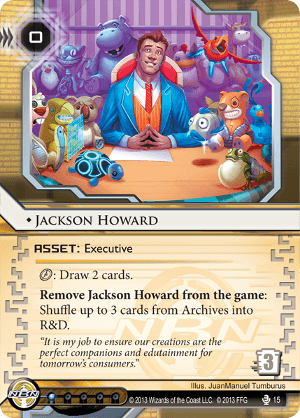 More specifically you should be on the lookout for telltale signs of agenda flood: Jackson on the table and a lot of card draw. Those cards the corp is dumping into archives? There are probably agendas there. This means that you need to run either Jackson or archives to force the corp to cycle them back into RnD ASAP, not only to remove the burst card draw Jackson provides, but to beef up agenda density in RnD. Read up on agenda density in more detail with this fantastic article from SimonMoon on Stimhack. As the corp you need to understand where you are most vulnerable and defend that server. Same as with running, there are some very basic heuristics you can use to know which server that is. Against Criminal you are most vulnerable to Account Siphon, so you absolutely need to protect HQ. Against Shaper and Anarch you probably need to be more worried about RnD because of Medium and The Maker’s Eye. Ideally you’ll protect both servers on your first turn, unless there is a better rush-focused plan (more about that later). As the game progresses you need to figure out where the primary central server area of attack is going to be. Where does the runner have their multi-access focused on? Where are their economy punishing cards directed? Focus your ice on what matters. As a corp you want to force the runner into action, and not allow them to build up their rig with impunity. If they do hold back, you need to be able to punish them for that decision. One of the best ways you can do this is by aggressively pushing out agendas early in the game, even if only behind a single piece of ice, or if the runner has demonstrated that they’re not planning to run unprotected servers, entirely out in the open. This works not only on a tactical level, but a psychological one as well. If you are able to pull this off it signals to the runner that you are trying to race them out. Next you can bait a trap with the same technique, or try to get them with some dangerous ice. It throws the runner off their game, which allows you to regain the tempo lost from scoring the agenda in the first place. The reason why tip #2 works frequently is because unrezzed ice is scary to the runner, and they’ll often not run until they have at least most of their rig installed. Use this to your advantage in order to not only to sneak out agendas, but to generally push your board state aggressively while the runner is trying to find their breakers. Don’t necessarily worry about having your central servers actually protected if the ice isn’t rezzed. Until the runner takes the risk and actually runs on it, they are assuming a worst case scenario. Unrezzed ice is much more of a deterrent than rezzed ice, so use it. This is more of a glacier strategy, but you have to remember that runs are expensive. On a net credit basis, getting the runner to run through ice multiple times will give you tempo, assuming those runs don’t result in any agendas stolen or important cards trashed. The best way to do this? Bait runs on your scoring server with assets that aren’t particularly important. This is one of the most important reasons to run 3/2 agendas in your deck–to establish the precedent that unrezzed cards could be an agenda. Again, this manipulates the psychology of the game and forces the runner to react to you. At that point you’ve gained the offensive and you are dictating what the runner does. If there’s any overall tip for the corp it’s this: as much as possible, make sure your turns put pressure on the runner to respond.